We arrived at Tosca a bit early and our table wasn’t ready yet, so we headed to the bar to enjoy a glass of Bellini. Complimentary nuts and chips to ease my growling stomach were served with the drinks. We ordered the 6 course degustation menu without wine pairing and selected the Beef Tenderloin and Foie-Gras as our main course. The other choice was a Tuna steak with white eggplant tartare. 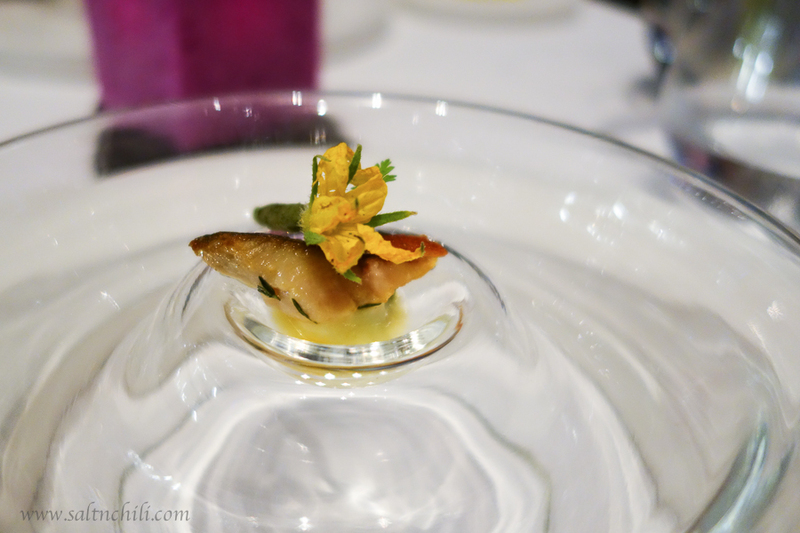 The Starter – Mackerel fish in a zucchini puree. The starter of mackerel fish in a zucchini puree was aesthetically pleasing and an interesting choice to start off with. To my surprise, the strong-tasting fish cleansed my palette but unfortunately failed to get my taste buds going. 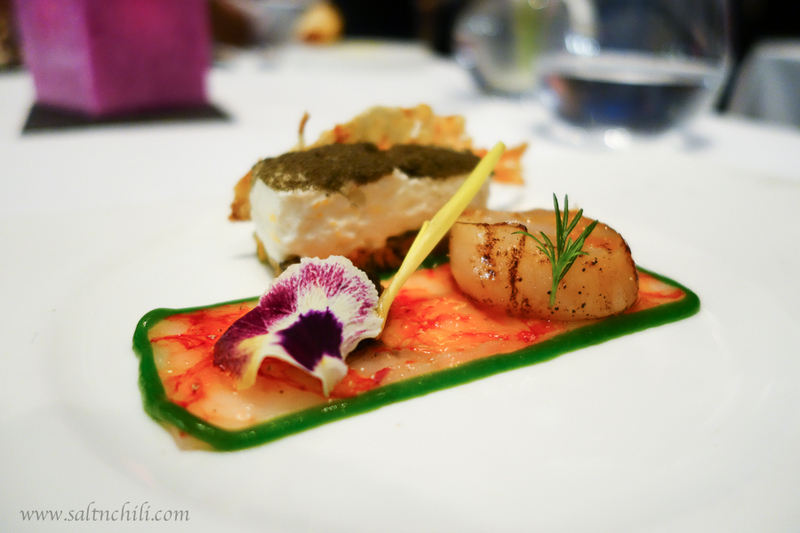 The Sea Tirasimu of prawn and scallop was all about celebrating the prawn, being the dominant shellfish in the dish. 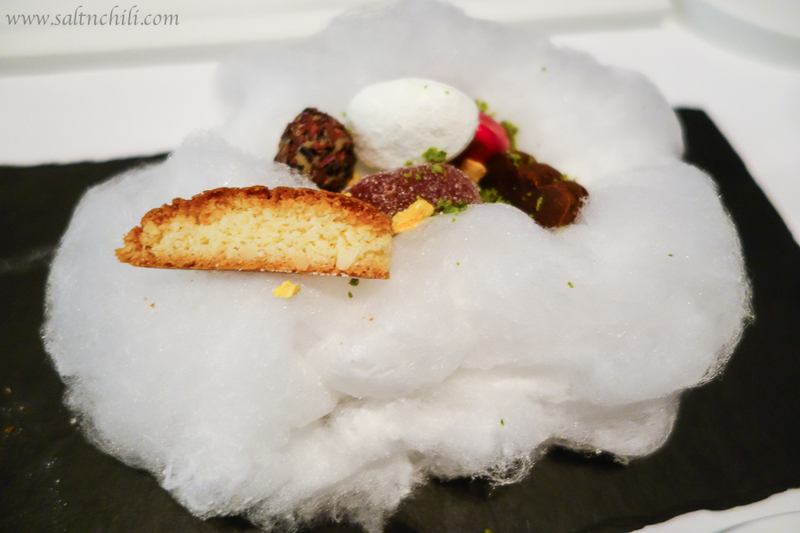 The flavors in the dish reminded me of Calbee Prawn Crackers. Again, this dish was beautifully presented but overall it was a bit of a let down for me. I felt it was trying a bit too hard to provide too different textures and leaving the flavor profile of the dish a bit one tone. I did like the usage of the raw scallop which really lightened up the dish. 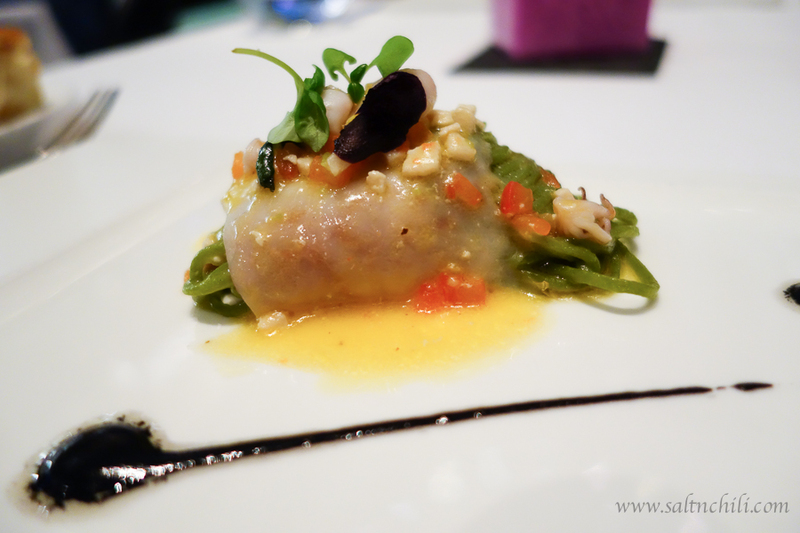 I was in awe with the vibrant colors and elegant plating of the Basil Chlorophyll Spaghetti wrapped in Swordfish. I loved the use of the Basil Chlorophyll in the al dente pasta bringing lightness and freshness to the dish. The Beef Tenderloin and Foie-Gras was the highlight of the meal for us. 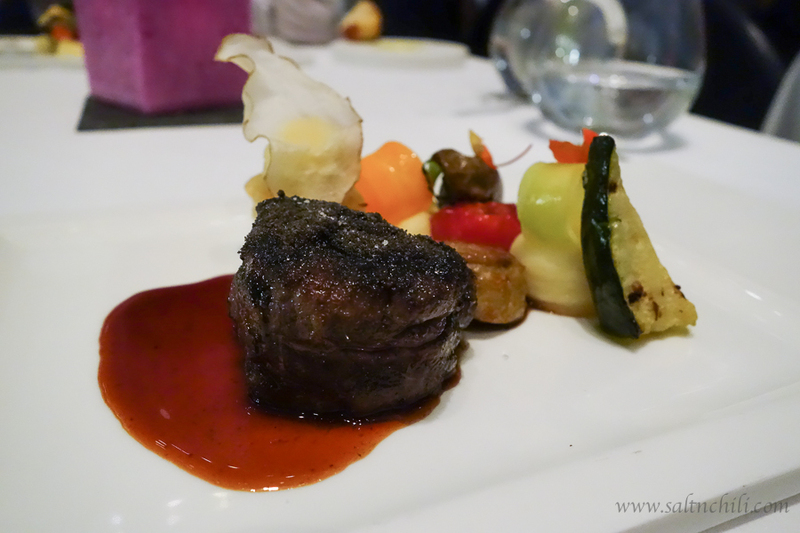 Perfectly seasoned aged steak paired with the creaminess of the foie-gras and a medley of veggies….we were in heaven! Midway through our dinner, there was a sudden halt in food. We sat waiting for our 4th course of cheese for 30 minutes. We had no idea what was going on, but I certainly wasn’t impressed. I was a bit grumpy by the time we got our cheese, so I completely forgot to take a photo. Oops! 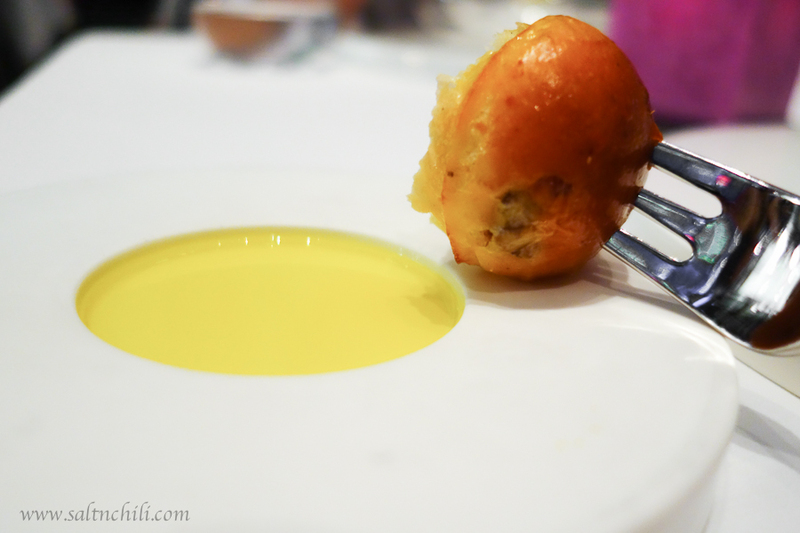 Needless to say, the dessert at this Michelin star restaurant was to die for. 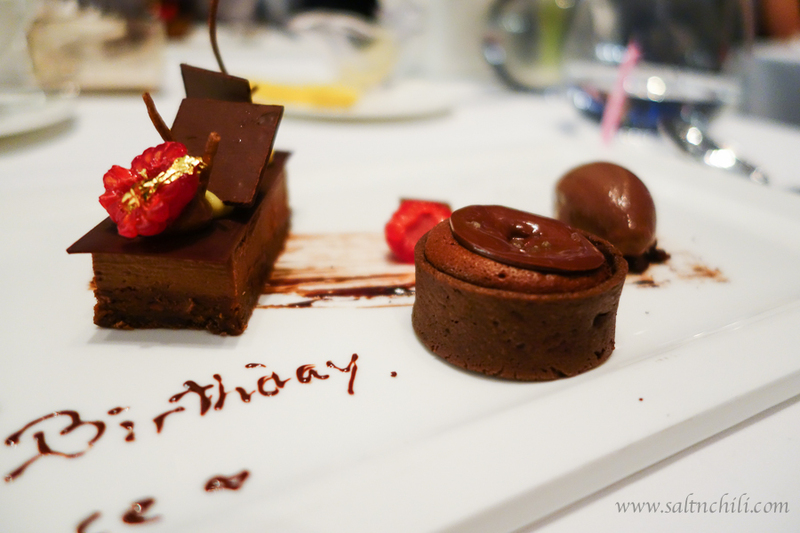 The Tosca Chocolate fondant delight was rich and oh-so heavenly! 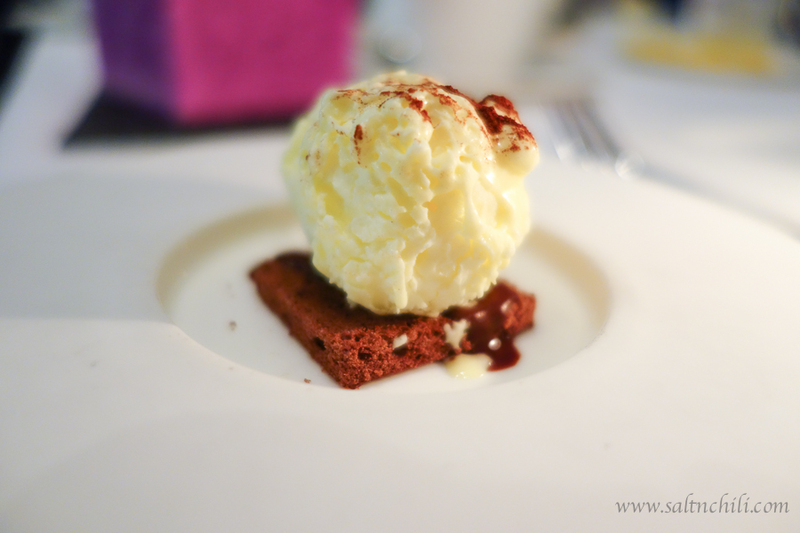 If you’re looking to splurge on a fine dining meal, and looking for an alternative to French, Tosca is a good option. Located in the luxurious Ritz Carlton, Tosca serves stunning Italian dishes with breath-taking view’s overlooking the harbor. Thank you hubby for this extravagant meal.